In our final CEP 811 blog post, we were asked to reflect on our learning from the past eight weeks. Taking into consideration our final readings from this week along with our experiences with the Maker and Design experiments, we were asked to write a blog post addressing the two areas of Professional Assessment and Evaluation and Personal Assessment and Evaluation. After engaging with Maker Education for the past few weeks, I definitely see myself implementing Squishy Circuits in my classroom. I am one of two teachers in my elementary school teaching fourth grade this upcoming school year, and I am teaching both classes Science while the other teacher is teaching both Social Studies. I plan on using my Maker Experiment 1 and 2 in my Science class to teach my students about circuits. I believe using the Squishy Circuits is a great way to engage students in what they are learning and empower them to think creatively. To evaluate the Squishy Circuit’s effectiveness, I will observe how my students constructed their circuits. In order to accomplish this, students must have a firm understanding of how the insulating and conductive dough works. In addition, they must have an understanding of how a circuit is made in order for electricity to flow properly. At the end of the lesson, based on the students’ list of key ideas and strategies for constructing their circuits, I feel like I will get a true indication of how effective the Maker lesson was. In our fourth grade curriculum, we teach a whole unit on energy transfer. This includes heat, electricity, and magnetism. So, I believe implementing Squishy Circuits in my classroom will fit perfectly with what students need to know in Science by the end of fourth grade. The opportunity to use the Play-Doh, along with the insulating and conductive dough, is a huge motivation for kids. There are so many awesome things you can construct using these materials, and allowing students to think on their own only pushes their creative spirits and allows room for learning to take place. With the Squishy Circuits, in order to successfully build a working circuit, “trial-and-error” must occur first in order for students to ultimately reach a point where electricity is flowing. Because of this, authentic learning takes place. I am greatly looking forward to teaching this unit this upcoming school year! I feel that my proficiency in the use of technology has increased substantially. Previous to my MAET experience, I never blogged and rarely used Twitter. Now, I consider my blog a great resource for me to refer back to during the school year to get lessons and other ideas to teach with. Additionally, Twitter has proven to be a great resource for me in several ways. Not only does it give me my news much faster than any local or even national news television channel, it gives me access to new ideas, thoughts, technologies, and other teaching practices that will undoubtedly serve me well in both my teaching profession and personal endeavors. I believe the evaluation process for this course is fair. Considering how open-ended and unrestricted the assignments in this course can be, I can only imagine how difficult it must be to grade them. With that said, the only suggestion I have is to make the rubric for each assignment more detailed and clear. Especially when being introduced to new technologies and resources, expectations can vary considerably. After reading the blog by Grant Wiggins, I think it is reasonable to assume the rubrics were left vague to leave room for creativity. After all, Wiggins says, “This is a worrisome misunderstanding: students are coming to believe that rubrics hamper their creativity rather than encouraging it” (2012). If the rubrics were more restricted, we would simply “do what was asked” and not dive deep into the assignments. Overall, I definitely believe the evaluation process for this course to be equitable. This week in CEP 811, we were asked to step out and “Choose your own (SoTL) Adventure.” The acronym SoTL stands for Scholarship of Teaching and Learning. The Office of Faculty and Organizational Development at Michigan State University defines the Scholarship of Teaching and Learning as promoting “…teaching as a scholarly endeavor and a worthy subject for research, producing a public body of knowledge open to critique and evaluation. Its intent is not only to improve teaching but to create a community of “scholarly teachers” who add to the body of knowledge about teaching and learning as well as benefiting from the SoTL research of others.” Overall, SoTL is a growing movement of using research methods to improve your own teaching skills in the classroom. It supports the idea that teachers must be lifelong learners. Eileen Bender and Donald Gray state in their book The Scholarship of Teaching, “The scholarship of teaching means that we invest in our teaching the intellectual powers we practice in our research” (Bender and Gray, 1999). It is very important as teachers to research new methods and remain sharp in the classroom. In our own SoTL Adventure, our objectives are to pick five scholarly resources that relate directly to our teaching practices and interests, write an annotation for each source, and utilize the Michigan State University Library system to search online databases and contact a librarian for recommendations. I chose to focus primarily on Differentiated Instruction. With class sizes increasing and the growing diversity of learning styles and abilities, I wanted to research this topic and share what I learned. This resource focuses on the “What,” “How,” “Show What You Know,” and “Where,” components of Differentiated Instruction. The “What” component refers to preassessing students’ knowledge and skill levels. The “How” component refers to increasing the ways in which you ask students to learn. The “Show What You Know” component refers to students reflecting, in many ways, on what they have learned in the classroom. Lastly, the “Where” component refers to the classroom climate and physical setting in which students are learning. This resource states that there are essentially three ways in which teachers can easily differentiate instruction. First, differentiate how students learn necessary course material. This focuses more on the teacher and how he or she delivers the information to the students. Second, differentiate how students demonstrate understanding of course material. This focuses more on the student and how he or she demonstrates mastery and understanding of the objectives. Third, differentiate what students learn. This focuses on adhering to the skills and interests of the students on the teacher’s part. Overall, although these three ways may seem simple, they help lay out a foundation for differentiating instruction in the classroom. This resource provides a basic definition of Differentiated Instruction, but more importantly, in my opinion, it provides resources for organization in the classroom, practicing patterns in Math using interactive web tools, using web based tools to chart the news, using technology to document learning, and reflecting on and categorizing traits of successful learners. All of these resources implement Differentiated Instruction. This resource suggests ideas for what you can do in your classroom and school in five minutes, five days, five weeks, five months, and five years to Differentiate Instruction. Some suggestions (in order) are: read students’ files, arrange desks into collaborative clusters or stations, share planning duties with a fellow teacher, get to know the diverse cultures and experiences in your classroom, and cheerlead and coach. This resource is all about using Differentiated Instruction to implement the Common Core State Standards. It is set up in two modules examining strategies in which to differentiate within the classroom taking into consideration the many changes to WHAT we are teaching in the state of Michigan and other states adopting these standards. What questions did you ask the librarian? I asked the librarian how to find free scholarly articles, how to know if a source is unreliable, the best ways to find information about differentiated instruction, and how to best use the internet to access the MSU Library. How did you contact the librarian? I contacted the librarian by first emailing and asking the above questions. My second time corresponding, I used the instant message feature on their website. This feature was very quick, for I was given answers immediately. How did you narrow your search to find resources that were meaningful to you? I narrowed my search to find resources meaningful to me by using key words in my inquiries. Also, once on sources, I quickly skimmed its readings looking for information relevant to differentiated instruction and the topics I was looking for. How do you see yourself using these resources in the future? In the future, I will likely only use the MSU Library resource for its instant messaging. Because responses are so quick, I can get the information I need immediately and continue working. When I was attending MSU as an undergraduate student, I used the library frequently and it was a great resource for me throughout my studies. Michigan State University. (2013). MSU libraries. Retrieved August 18, 2013, from http://www.lib.msu.edu/. This week’s CEP 811 assignment is centered on editing and revising our Maker Experiment #1. In our first Maker Experiment, our task was to create a lesson where students use their Maker Kits (Squishy Circuits) in the classroom. In Maker Experiment #2, we are using UDL (Univeral Design for Learning) Guidelines to revise and reshape our lessons. Overall, I am excited to revisit Maker Experiment #1 and revamp it into an even more powerful lesson! Students will be able to create a working circuit. Students will be able to create a face using the Squishy Circuit and Play-Doh materials provided. Conductive: to act as a medium for conveying something such as heat or electricity. Insulating: to cover, line, or separate with a material that prevents or reduces the passage, transfer, or leakage of heat, electricity, or sound. The students will read their two objectives written on the whiteboard silently first and then all together as a class so they know from the beginning what will be expected of them to have accomplished at the end of the lesson. The teacher will introduce Squishy Circuits using the following YouTube video as an anticipatory set: http://www.youtube.com/watch?v=UDZo51k2BWQ This video will help students gain an understanding of the tools they will be working with. Also, it will hopefully put their minds and anxiety at ease with working with electronics. The teacher will pass out the Squishy Circuits and Play-Doh to allow students to play on their own for five minutes. Using the conductive dough first, roll one little piece into a ball. Now, roll a larger piece of conductive dough into a cylinder shape so it looks like a snake. Next, roll a piece of insulating dough into a cylinder shape just as big as the one you just finished. Wrap the insulating dough snake around the conductive dough ball. Then, wrap the conductive dough snake around the insulating dough snake. Make sure the two pieces of conductive dough are not touching. You should have two pieces of conductive dough separated by one piece of insulating dough. Also, the overall shape should be that of a round circle. If your shape does not look like this, reformat the dough with your hands. Using the battery pack, put the black wire into the outer ring of conductive dough, and put the red wire into the inner ring of conductive dough. Using Play-Doh, students can build their faces on top of their round shape as creative as they would like using any colors, styles, and formations. Insert the LED lights on top of the face after the face has already been made and placed on top of their round shape. Insert the LED lights so one leg of the LED is stuck in the outer conductive dough, and the other leg of the LED is stuck in the inside conductive dough. Have fun, and enjoy your new creation! The teacher will go through each direction step-by-step while walking up and down the rows monitoring students at their individual desks. Scaffolding will be essential with the teacher to guide students in the right direction to making their circuits successfully. Students will be provided with sticky notes at their desks to write down notes about what is working and what is not working in building their circuits. This will help the teacher identify students’ problems and how to help them better. Also, this will help students remain focused on their objects and motivated to complete their circuits. After creating their Squishy Circuit and Play-Doh faces, students will put all of their materials away and come back together as a class. The teacher will pair students up in groups of two and ask them to take turns explaining the thought process behind the creation of their faces and how their circuit works within their faces. The students will be encouraged to go into detail explaining how their circuit works and the creativity behind their Play-Doh faces. After partnering up, the class will reconvene and discuss whole group what was easy about using Squishy Circuits and what was difficult. As a whole class, the teacher will make a list with students’ help of key ideas/strategies for making a circuit, and what was learned overall will be posted in the front of the classroom for the entire class to see. As an assessment, students will write one paragraph explaining everything they learned about how to construct a circuit and how they created their Squishy Circuit and Play-Doh faces. The teacher will model this by providing a sample paragraph for students to know what is expected of them. Students will only be able to see the sample paragraph for one minute to avoid any copying. Students will display their Squishy Circuit and Play-Doh faces in the hallway outside of the classroom for other students in the school to see. Students who have difficulty making their circuit can be allowed more time the following day during recess where more individual attention can be provided. Without a doubt, my revamped Maker Experiment, Maker Experiment #2, is much better and will definitely ensure student learning and success. To support UDL and revise my lesson to make it better, I added several key components. First, I added pre-teaching of the vocabulary words “conductive” and “insulating.” It is important for students to have a firm understanding of what these two words mean before they begin experimenting with the Squishy Circuits. Next, I added the teacher making a list of key ideas/strategies for making a circuit and what was learned overall and posting it in the front of the classroom. This addition would certainly help student comprehension. Next, I added scaffolding by the teacher in the middle of the lesson to limit student frustration and encourage determination. In this lesson, it is likely students will get frustrated at times if their circuit is not working, so it is imperative that the teacher is aware of this and present in order to provide encouragement. Next, I added providing sticky notes for the students at their desks to write down notes about what is working and what is not in building their circuits. This will definitely help students stay on task, and it will help the teacher identify where students are struggling so he or she can possibly stop the class, bring everyone back together, and correct some mistakes students are making. Next, I added an assessment where students can write a paragraph explaining everything they learned. In addition, the teacher will model this by showing a sample paragraph so students know what is expected of them. For shy and more reserved students, this assessment will provide another opportunity for them to express themselves. Lastly, I added an accommodation where students who are having difficulty making their circuit can be allowed more time the following day during recess where more individual attention can be provided. As a whole, I believe these additions have made my lesson much more powerful. I already had several components of my lesson that were in support of UDL. First, I already had alternate representations of the learning objectives. Students were learning by working hands-on, watching a YouTube video, collaborating with their peers, and summarizing what they had learned as a whole class. Second, I had several accommodations already built into the lesson, but they were not explicitly stated in my original Maker Experiment #1. An example of this is scaffolding. It is crucial for the teacher to encourage students throughout this lesson and limit frustration as much as possible. When working with electronics, students can definitely become anxious and agitated, so the teacher must combat this with help and support. I made sure to add this into my Maker Experiment #2. In conclusion, UDL Guidelines are very important and helpful to creating a great lesson plan. This week in CEP 811, our challenge is to design a 21st-century classroom following the principles of Experience Design. Tedde van Gelderen describes Experience Design as something we encounter every day. We all have experiences as we live our daily lives. He relates these experiences to four specific qualities: time, flow, participation, and emotion (van Gelderen, 2009). Although van Gelderen does not explicitly mention education in his examples of Experience Design, a classroom, school, or educational setting can certainly fit into “an experience.” Considering these principles of Experience Design along with using the SketchUp software, our task is to deeply consider the environments in which students attend school and how conducive they are for learning to take place. Last school year, my 2nd grade classroom was a typical square room with desks aligned in rows facing the front whiteboard. It came equipped with only one school computer for the students to use, although I did have an interactive Smart Board and document camera. I believe my classroom was very conducive for student learning, but there were two disadvantages that stand out to me. First, my classroom always felt overcrowded. With twenty-five students and the constant transitions that take place at the elementary level, it always felt cramped and congested. Second, with only one student computer for twenty-five students, I was always scheduling trips to the computer lab and making use of the Smart Board. We did the best we could with the resources available to us, but I always thought there was more I could do if I had just one more computer or even access to laptops. As a result, I formulated a plan to solve these two problems and make learning easier in my elementary classroom. My plan for restructuring my 2nd grade classroom would be very simple. Instead of desks aligned in rows facing the front whiteboard, I would take out the desks and put five round tables in with five students at each table. I believe this would promote more group work and collaboration among students. Relating to the Theory of Multiple Intelligences, incorporating tables for students instead of desks would help with the interpersonal area where students learn from interaction with others to communicate effectively and empathize easily with others. With desks, in contrast, students were much more on their own and not learning from others. Moreover, in dealing with the problem of having only one student computer, I would keep the one computer and buy a tablet for the students to use as well. This would be cheaper in price, and it would allow students to access it in different places around the classroom. Since our entire school is equipped with Wi-Fi, students would be able to sit on the carpet, for example, and play educational games. Relating to Experience Design, this would create a much better flow in the classroom, for students would be able to sit comfortably wherever they wanted instead of always being confined to one specific area. Much effort and many resources would likely be needed to accomplish this change to my 2nd grade classroom. I, along with my students, could fund-raise to be able to afford the tablet and five new tables and chairs. In addition, teacher grants are always available, and I could apply for one to get the resources I needed. Our school P.T.O. (Parent Teacher Organization) is always a great resource that helps with supplying classrooms. Overall, factoring in the tablet and five tables and chairs, I would need around $700 to make my design a reality. I believe my design is completely realistic, and it could help improve student learning tremendously. You can see my embedded imagined learning space below. In this week’s blog, I will express what I have learned about MOOCs (Massively Open Online Courses) by outlining a mini-online experience or “Ultra Micro MOOC” using the P2PU design. To create the outline of my MOOC successfully, I will need to adhere to the principles Dr. Stephen Yelon articulates in the video, “The Secrets to Instructional Design” (Yelon, 2001). Dr. Yelon states, “There are certain elements that must be present for an effective piece of instruction, and they must all be consistent with one another.” I will strive to include and connect the following components of Dr. Yelon’s “secret” to instructional design: Real World Performance, Terminal Objective, Content, Methods, and Evaluation. In my Mini-Economy Classroom Management course, my peers will master managing a classroom successfully by creating a classroom management style that incorporates money and posting updates/sharing ideas. 3. Who is coming to your course? What will attract them? Why would they want to participate in this experience? I believe my Mini-Economy Classroom Management course would likely attract teachers and educators of all sorts. Whether it be elementary, middle, or high school, I believe my course would be beneficial. It would not be relevant at the collegiate level. Educators would be attracted to the idea of finding a new, fun, and effective style of managing their classroom. Especially with beginning teachers, classroom management is absolutely paramount, so my course would help them tremendously. Educators would want to participate in this experience to first learn a new style of classroom management but also to have the opportunity to communicate with fellow teachers to share how their similar experiences with using this style are going. 4. What do you want learners to be able to do when they are done? (Connect your thoughts here to the learning theories you explored last week and the design principles you learned this week.) How long is your course experience? When learners are finished taking my course, I would like them to be able to create and administer a successful classroom management system that incorporates money. With the use of play-money, students would have practice with real-life situations. The Constructivist Theory believes that learning experiences should be authentic and produce real-world learning environments that allow the learner to construct their own knowledge. An example of using the Constructivist Theory in accordance with a classroom management style incorporating play-money would be when a student is on task and doing a great job in class, they are rewarded with more money at the end of the week versus the opposite when poor behavior warrants less money at the end of the week. In addition, one of the key elements in Dr. Yelon’s video, “The Secrets to Instructional Design” is Real World Performance, which talks about how learners will use what they have mastered as citizens and educated people in the world. Without a doubt, students at the elementary, middle, and high school level will eventually use and manipulate money on a day-to-day basis as adults. My course experience would likely be three to four weeks in length with each module I show being less than one hour apiece. I would only show three modules a week but allow ample enough time for learners to communicate with each other whenever they wanted to share experiences or ideas. 5. What will peers make? Students get paid $5.00 per day for showing up and doing their best all day (That’s their job!). If a student does not have their homework, they only lose $1.00 for the first day (We all forget sometimes! ), $5.00 for two days late, and $10.00 for a third day. Students will lose money for not doing their expected job in the classroom. Paychecks go home on Fridays. Please ask your child to show you their paycheck. If they get paid $5.00 per day, they can earn $25.00 if they do their job. Students should not be earning below $15.00, unless it’s a short week. $20.00 desk rent will be collected at the beginning of each month. Students must save for this. Students should always keep at least $10.00 in savings for emergencies. For example, if I make a booklet and a student loses it, they will need to buy a new one from me. If you have any questions, ask your child – they’d love to talk about it! The beginning of the course would be primarily focused on creating the classroom management system that fits each individual classroom. Expectations, needs and wants, and responsibilities differ from elementary classrooms, for example, to those at the high school level. Using the Mini-Economy system, teachers could tweak it to best accommodate their students and classroom. Once the system is established, the second half of the course would be focused on administering the system. This part would rely heavily on collaboration of peers discussing how the system is being used and how it has been successful/unsuccessful. Dr. Yelon suggested it is imperative for an instructional design to have a method to help participants learn. This is what would be largely discussed among the participants of my course. Since every teacher is different, they would all try their different management styles and come back together to discuss what worked best. As a result, educators would learn from each other how to best implement their system and manage their classrooms successfully. 7. How will peers help each other in your course? Peers will help each other tremendously in my course. As mentioned, educators will not only share their created management system, they will also share how their system is working/not working in the classroom. Through collaboration and sharing of these experiences, I believe participants in my course will gain a better understanding of how to manage a classroom successfully using play money and economic principles. In addition, students will feel as if they are part of a unit or team, and there will undoubtedly become a new sense of accountability restored in the classroom. Overall, I definitely believe MOOCs (Massively Open Online Courses) make giving information much more compelling than the traditional style. It definitely pulls away from the traditional method of standing and telling students “stuff” or simply lecturing. It encourages collaboration and sharing of ideas among peers rather than one person having all of the knowledge in the room simply telling everyone else what they know aloud. I will certainly consider joining and creating my own MOOCs in the future. This week’s CEP 811 assignment is centered on creating a lesson where students use their Maker Kits (Squishy Circuits) in the classroom. In addition, this lesson will have strong connections to learning theories we have studied throughout our MAET experience. Overall, I am excited to dive even deeper into using Squishy Circuits and see how they can be utilized in the classroom setting. When reflecting upon my lesson, I noticed connections between different elements of the lesson and several different learning theories. However, the Constructivist and Experimental Learning theories stood out as having the most parallels. The Constructivist learning theory states that “Learning is an active process in which learners construct new ideas or concepts based upon their current/past knowledge” (Bruner, 1966). In my lesson, students are actively learning by applying their prior knowledge of Squishy Circuits to construct their Play-Doh faces. Relying on structure from their teacher, students are not simply passive recipients of knowledge, but rather they are using their knowledge to construct something new. The Experimental Learning theory, in essence, states that learning is achieved best through reflection on direct experience. At the end of my lesson, students share their Squishy Circuit Play-Doh faces with a classmate and talk about the thought process and creativity behind their creations. In addition, the class reconvenes to discuss what went well and what was difficult about using the Squishy Circuits, which forces them to reflect on their experience and gain valuable knowledge. Overall, there are strong connections between components of my lesson and the Constructivist and Experimental Learning theories. This week in CEP 811, we watched a video and read an article from Punya Mishra on the topic of “Repurposing.” Mishra discusses the fact that many of the tools or manipulatives teachers use were not originally invented for use in the classroom. Teachers take it upon themselves to repurpose tools they find for use in the classroom (Mishra and Koehler, 2008). From my experiences as a teacher, a great example of this is using Play-Doh as a manipulative for students. In doing some research, I found that Play-Doh was originally used as wallpaper cleaner back in the 1930s. You can read the article about Play-Doh here: http://www.huffingtonpost.com/2013/06/14/play-doh-wallpaper-cleaner_n_3430042.html. It was not until the 1950s when Play-Doh was first introduced in schools, kindergartens, and nursery schools. As an elementary school teacher, I have used Play-Doh in the classroom multiple times with my students. It is a fun and excellent tool to use to engage students and help them use their creativity to explore new concepts. Our assignment for this week was to visit a thrift store and find items to combine with our kits to make a new invention we could use in our classrooms. This assignment was very challenging for me, but I found it intriguing because I had the opportunity to come up with a completely original idea I could potentially use in my classroom. From our readings, I learned, “Quality teaching is the transformation of content. It is the act of learning to think in a disciplined manner” (Mishra and Koehler, 2008). This week, I had to combine my thrift store items and kit and transform or repurpose them into an idea to use in my future classroom. It undoubtedly took thinking in a disciplined manner to achieve this task. At Goodwill, I was able to locate several used containers of Play-Doh. Although a bit dirty, I believed them to be necessary for the idea I had in mind. The kit I used was the Squishy Circuits Hardware Kit. Overall, Squishy Circuits use conductive and insulating dough, a battery pack, and LED lights to allow you to construct a circuit. I used the photo above as inspiration for my classroom activity. 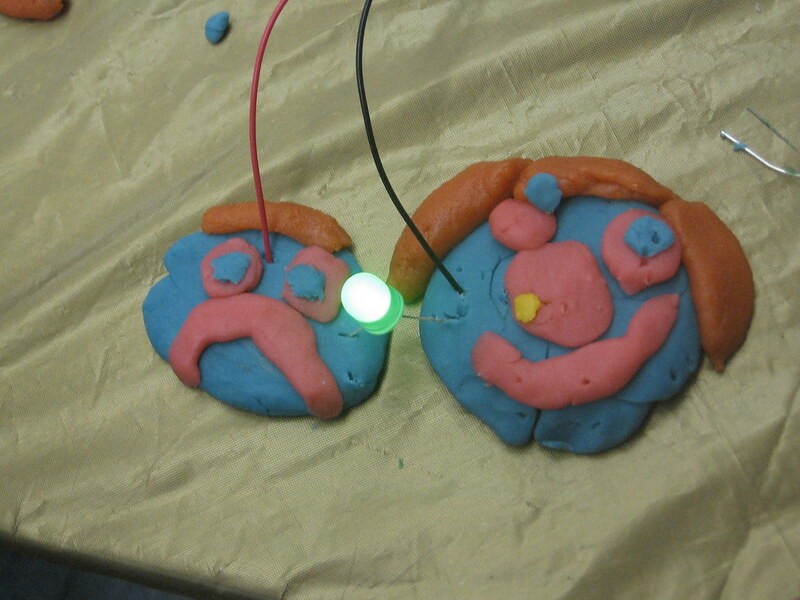 My task for students is to combine as much Play-Doh as you can along with the Squishy Circuits to make a face. My only rules would be that they can make any design of face they would like, but they must incorporate at least three working LED lights within the circuit. So, students must successfully set-up the circuit while also incorporating it into the design of their face. Since I teach at the elementary level (and because I am a beginner with Squishy Circuits), I wanted to keep my activity simple. However, although simple, I believe it to be effective in teaching students about circuits while keeping them engaged and allowing them to have fun with the Play-Doh. Overall, the students’ faces incorporate the “hot dog” circuitry on the underside, and the wires stick through the insulative dough to the conductive dough underneath. 1. Using the conductive dough first, roll one little piece into a ball. 2. Now, roll a larger piece of conductive dough into a cylinder shape so it looks like a snake. 3. Next, roll a piece of insulating dough into a cylinder shape just as big as the one you just finished. 4. Wrap the insulating dough snake around the conductive dough ball. 5. Then, wrap the conductive dough snake around the insulating dough snake. Make sure the two pieces of conductive dough are not touching. 6. You should have two pieces of conductive dough separated by one piece of insulating dough. Also, the overall shape should be that of a round circle. If your shape does not look like this, reformat the dough with your hands. 7. Using the battery pack, put the black wire into the outer ring of conductive dough, and put the red wire into the inner ring of conductive dough. 8. Using Play-Doh, students can build their faces on top of their round shape as creative as they would like using any colors, styles, and formations. 9. Insert the LED lights on top of the face after the face has already been made and placed on top of their round shape. Insert the LED lights so one leg of the LED is stuck in the outer conductive dough, and the other leg of the LED is stuck in the inside conductive dough. 10. Have fun, and enjoy your new creation! In conclusion, I found that incorporating Squishy Circuits in education can have great benefits. Squishy circuits can help students exercise creativity, and the Play-Doh definitely helps put students at ease who may otherwise be intimidated by electronics. As a whole, squishy circuits provide students with the opportunity to design, create, and invent truly original ideas.